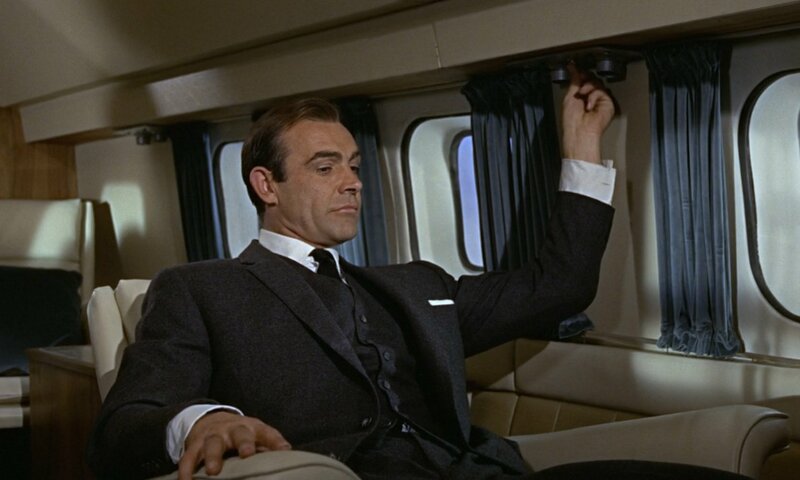 The final scene of Goldfinger features Sean Connery in his second three-piece suit of the series, a charcoal grey woolen flannel. Bond believes he’s on his way to meeting the President of the United States, giving Bond a reason to wear the added formality of a waistcoat. A flannel suit is also comfortable for an flight, since it’s both comfortably soft and warm. The suit is the usual Anthony Sinclair suit, a button two with natural shoulders and a full chest. The jacket is detailed with four buttons on the cuffs, jetted pockets and no vent. The buttons are made of dark grey horn. The waistcoat has six buttons with five to button. The inside of waistcoat and the sleeves share the same navy and white striped lining. The trousers are cut with double forward pleats and have button side adjusters and plain hems. Connery wears shirt from Frank Foster in white with a faint broken grey stripe. The shirt has a spread collar, front placket and double cuffs with rounded corners. The tie Connery wears is the Fleming Bond favourite: a black knitted silk tie tied in a four-in-hand knot. The knitted tie is too casual for this dark three-piece suit, and not appropriate for a meeting with the president. 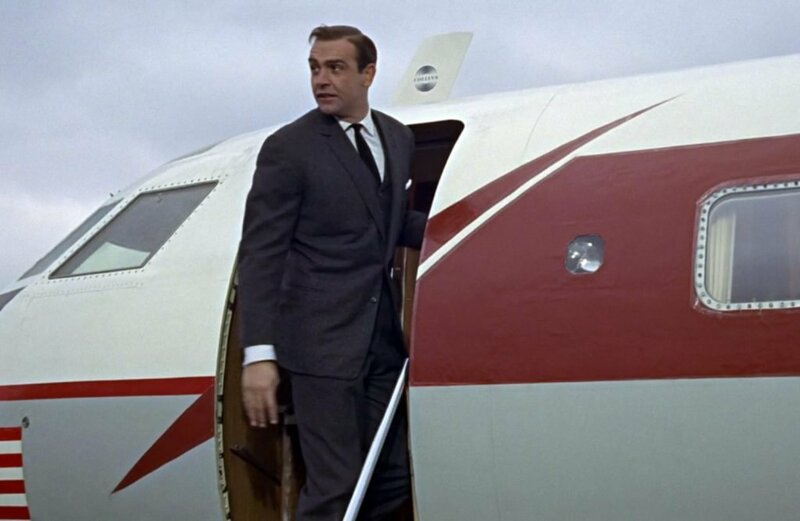 A black grenadine tie like Connery usually wears in his other Bond films would go better with the suit and for the occasion. His shoes are black. This suit is very similar to the next suit Bond wears, featured in Thunderball‘s pre-title sequence. The Thunderball suit differs most obviously by having a straight bottom to the waistcoat and turn-ups on the trousers. By the way, Matt, I always thought that charcoal a very dark grey, and was very similar to black, and thus thought that this suit (and others) was just a dark grey one. 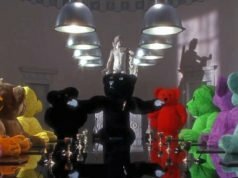 Can you indicate me a Connery era suit that is made of dark grey, but not charcoal, please ? Thanks a lot. I was waiting for someone to notice that! It seems to be there in every other shot. Charcoal can be labelled to any type of dark grey. If it’s really close to black, that’s sometimes called oxford grey (which can also be lighter shades of grey). The suit on the train in From Russia With Love is what I consider dark grey. But I have a pair of trousers about that colour that are labelled charcoal. About this error, Brosnan “made” the same in TND. 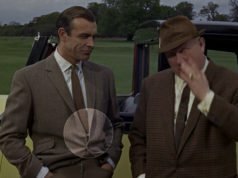 But, did you notice that at the end of the golf scene in Goldfinger, Connery attached one of his cufflinks the wrong way (I saw it thanks to your screenshot !)? It does destroy a little the myth of the style-conscious Connery… Maybe he didn’t care a lot about clothing, finally. I’ve always been under the impression that Connery cared little for suits or fine clothing, placing far more importance on comfort. Terrence Young made him look more suave, cool and gentlemanly. Left to his own devices Connery doesn’t always do even simple things, such as not fastening the bottom button on a 2 button suit. I agree. Connery made few little mistakes : he can be seen with both his suit buttons fastened in DAF, for instance. Ah yes, the cream linen suit with the awful tie. They really dropped the ball on that one. His disdain must have ran deep, as surely after several films he would have known how to dress himself. It’s a shame that someone who managed to look so effortlessly cool in some clothes (I’m mainly talking about Goldfinger) didn’t care at all about it. Maybe that was the magic ingredient. That’s right. I remenber he buttoned the two buttons of one of his suits in Dr No, From Russia with love, and of course Diamonds are forever. Another funny thing, buttonning all the buttons is certainly ugly, but it doesn’t even make the suits more comfortable ; it musy be the contrary I think. I might be totally wrong, but isn’t it that not only is dark grey lighter than charcoal but also that it’s a “warm” nuance as opposed to the “colder” charcoal? The dark grey suits that Connery wore where more brownish while his charcoal suit was more blueish. Am I correct, Matt? It’s not that simple. Charcoal by definition has a hint of blue, as you can see in this suit, but it has come to be synonymous with dark grey as far as suiting goes. A medium grey is around a 50% tint. Dark grey and light grey are relative in comparison. My only complaint about flannel is that, while soft and warm, in my experience it tends to wrinkle more easily than a hard worsted for some reason. I can’t remember exactly what it is. So for a plane flight… I’d rather avoid crotch spiders personally. Really? I’ve found it to be quite the opposite. Though all of my flannel is quite heavy, so that may have something to do with it. In terms of weight, do you mean heavy flannel in a 13-14oz weight? for less likelihood of wrinkles? Yes, a minimum of 13 oz for flannel, and that would be somewhat light for flannel. I see no point in getting flannel that’s any lighter, though it’s made for people today who like everything lighter. Will be going for the Fox brothers 370/400g at the moment but do you recommend going for the heavier 530/560g weight? 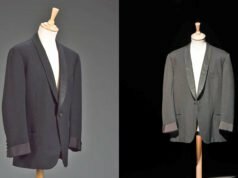 Also, for both charcoal and navy flannels, would you happen to know the colour of the lining that Sinclair would have chose for Connery’s suits? I would recommend 370/400gr as the perfect weight for a flannel suit these days. 530/560gr would drape excellently but is incompatible with modern heating. Sinclair typically matched his linings to the suitings.